Working in wood and especially creating children’s toys, has become a real passion for Errol van Blerk. He started with his grandchildren, making cots and cradles when they were infants, and then cars and trucks, rocking horses and educational toys, and more, as they got older. All the kids have loved them, so he branched out and made gifts for the other kids in his life too, and they’ve also been a huge success. And even some of the adult 'kids' have especially taken to his scale models of cars and trucks. So, then it just seemed an obvious next step, to make these toys and other products, available to people generally. As one grandmother wrote of her year and a half old grandson James - "I like my blocks. They make excellent roads and walls. And I like my cart too. I am using it to drag all my favourite soft toys around. Mummy says I should put the blocks back in the cart at night, but this is because she doesn't understand that blocks don't need a place to sleep and the toys do. And besides my arrangement helps enlarge my vocabulary because I learn new words when Daddy steps on the blocks in the dark." Errol has created a lovely line of tissue boxes that turn ordinary cardboard tissue boxes into a pretty addition to your home or office. 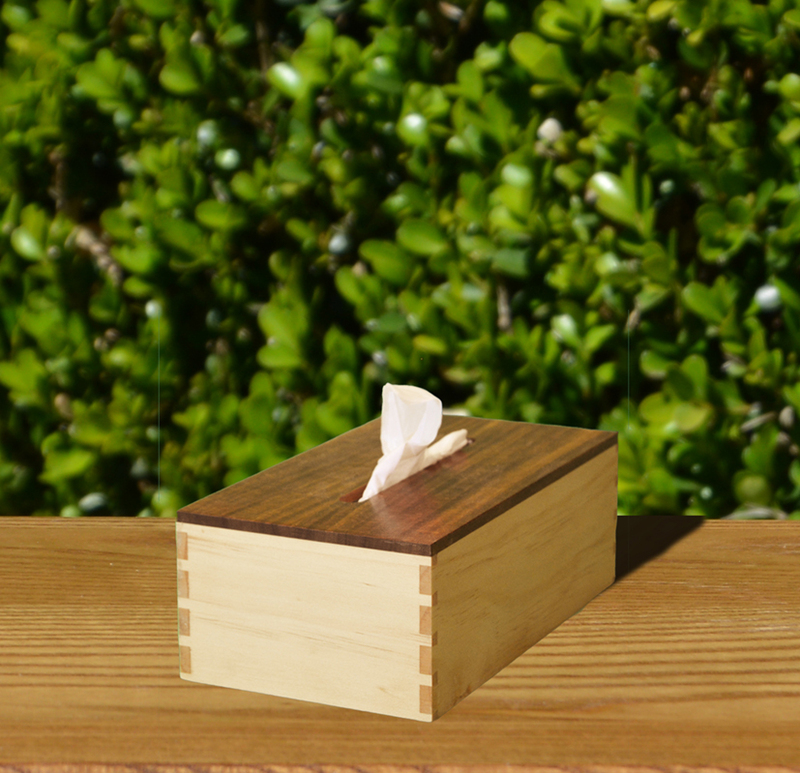 There are three sizes, Large, Small or Square, to fit the tissues boxes sold on the Australian market. The boxes come in three sizes and are made from a range of natural timbers. They are finished with a clear, hard-wearing poly urethane coating that accents the natural colours of the woods and allows it to be wiped off easily with a soft cloth. A friend recently wanted a business card holder for her desk, but not the plastic kind so easily available in the stationary shops. When she mentioned it, it seemed like such a good idea, that Errol went into the workshop and created a couple of different styles that are sleek in design, and would add a note of distinction to any desk. And when his wife needed a holder for her scrap printer paper, the scrap notepaper holder was born - handy and attractive too. They all come in a range of timbers to suit your own tastes. As a great addition to your sewing basket, or as a quirky gift for someone else, you can't go wrong with these handcrafted wooden sewing & darning needle holders. They are both useful and attractive. Simply choose the style that appeals to you the most. The needle holders are made from a variety of natural woods and are available in a variety of shapes. All are beautifully finished to add a distinctive touch to any sewing project. Errol's family has been getting bigger, so instead of trying to find matches to the brass Christmas stocking hangers that the family had been using since the children were small, he has created a whole new look with these lovely wooden hangers. There are four styles to choose from, a Christmas tree, a bell, a snowman and a Christmas present. Whether you are decorating your mantelpiece, or hanging your stockings from a bookshelf (or anywhere else where Santa can find them) these lovely hangers will add a soft and whimsical touch to your Christmas decor. As a professional facilitator and trainer, Errol had often found himself frustrated with flipchart pens rolling away or falling off the flipchart stand. When he checked around for a commercially available solution, he discovered that none existed that met his specific needs. He wanted a small box, just large enough to hold a full set of Mr Sketch pens, and that travelled easily. When he couldn’t find what he was looking for, Errol decided to create one himself – and that’s how the Trainer Pen Box came to be.